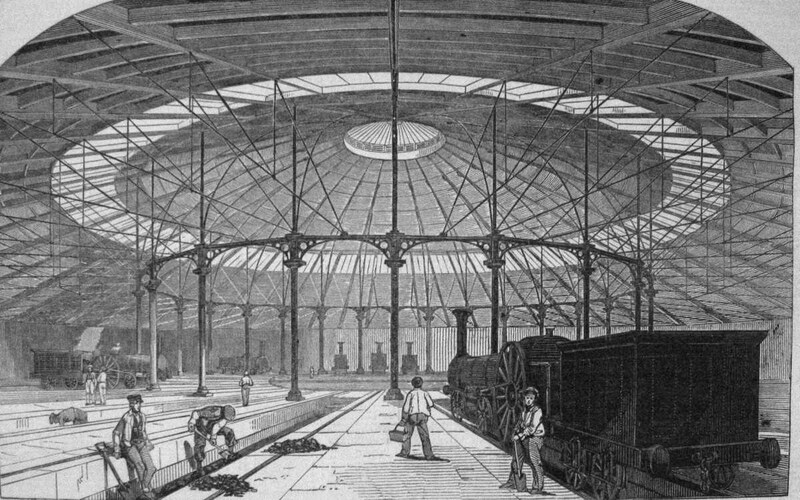 The first locomotive engine shed was built on the up side (leading into London). The Roundhouse, 160 ft in diameter, was built as an engine shed and turntable for goods locomotives in 1846-1847, also on the up side. It had become necessary because the down passenger trains out of Euston now passed at speed through the station, which was no longer the locomotive terminus of the line. The first example of a truly circular engine shed, the structural form was influenced by the limited space on the north side of the yard. The building could hold 23 engines, one between each pair of columns, with the 24th track left clear for entrance and exit. In the centre was a turntable 36 ft in diameter on to which the engines had to run to be turned into their berths. Below were brick vaults, founded at natural ground level, which raised the turntable and engine storage bays 15 feet (4.5 m) to the railway level. In 1854 the L&NWR decided on its abandonment as a locomotive depot, as it lay in the way of the strategic replanning of the northern side of the Goods Yard (and probably also because locomotives were now running longer distances between maintenance stops). It was briefly a corn and potato store, and from 1869 to 1963 became a bonded store for Gilbey’s wines and spirits. Since then it has been through several transformations as a centre for the performing arts. Most recently, over 2004-06, it has benefited from major investment to recreate the Roundhouse centre for the performing arts and provide a creative centre for young people. It has become once more a major cultural landmark in North London, with a remarkable range of activities. The Roundhouse, Grade II* listed, is the oldest surviving former locomotive engine shed in the country, if not the world.